Mayank Tehlan is a right-handed batsman of Delhi Cricket team. He is an all-rounder in the team. Mayank was born on October 11, 1986 in Delhi. This right-arm offbreak bowler of Delhi Cricket team is the cousin of cricketer Virender Sehwag. Mayank Tehlan has also played for Delhi Under-14s, Delhi Under-19s and India Under-19s Cricket team. 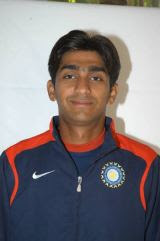 Mayank Tehlan is a middle-order batsman and is one of the older members of the Indian Under-19 World Cup squad. He debuted in the "List A" matches in 2003/04. Mayank has played in total seven "List A" matches. His sum of score in these matches is 75 runs and his highest score in any of these matches is 42 runs. Mayank Tehlan`s average is 12.50 and striking rate is 59.05 in these matches. His latest "List A" match was against Pakistan at Delhi on November 2, 2007.